The reader who spotted this drink (Megan) mentioned that it looks like a lot of whisking to get the cocoa powder to blend and mix to create the beverage. She asked about the “Reserve coffee” part of it, and apparently it is Colombia Santana El Bolson (pulled as espresso shots) as the Reserve coffee base of the drink. Megan loves this drink! I wish I could try it! In January this year, Starbucks tested the truffle mocha again, only this time with different truffles. In the spring of this year, Starbucks tested a milk chocolate mocha. 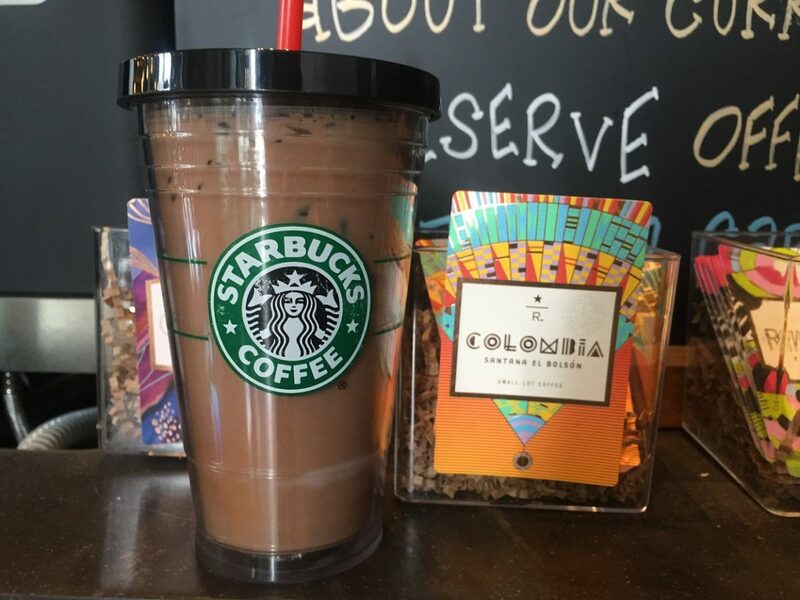 And now we have the Reserve Iced Dark Chocolate Mocha made with a dark chocolate cocoa powder! 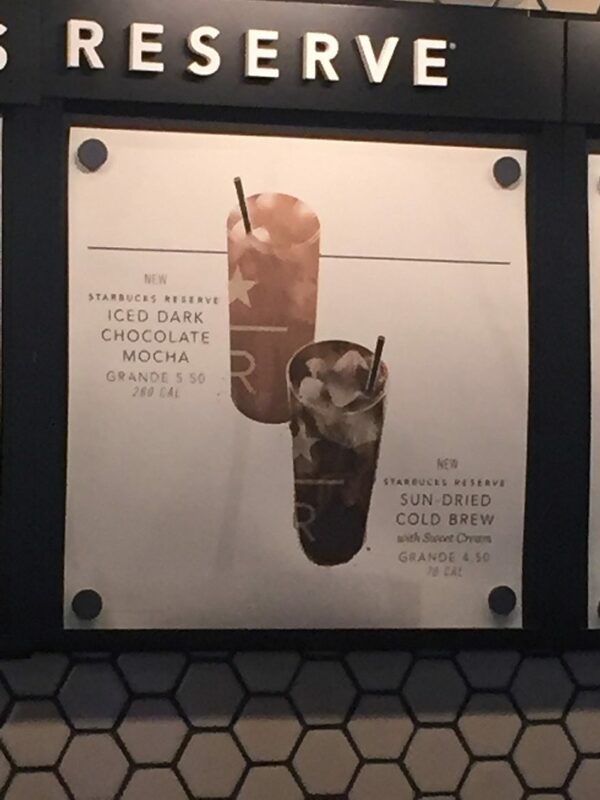 If you are looking for this beverage, Megan said she spotted it at the Starbucks at 200 North Michigan Avenue in Chicago. That’s a lot of mocha tests within about one year! So if you were to change up the Starbucks mocha, what would you do to it, if anything at all? Keep in mind that Starbucks tests many more products and concepts than what makes it to a national launch. If you like reading about tests, you can find many more Starbucks test stories here. The Reserve Iced Dark Chocolate Mocha and Reserve Sun Dried Cold Brew are currently available at select Reserve stores in Chicago as well as a small number of stores in other cities. There are two Washington state locations offering these test drinks. I have now tried the Reserve Iced Dark Chocolate Mocha and it’s wonderful! Cool, my cup is famous! Haha! I came to the site this morning and it was like BAM! My photo was on the main page, thanks for sharing! I was doing so well by not going to Starbucks every single day but I have been going every single day again because of this drink. Hopefully it will be here to stay because it’s really good! This weekend I will check other reserve stores to see if they have it as well. My first fix would be to bring back the Mocha Valencia from years ago. I’ve never found a Mocha that I have liked since. Hard to explain, it’s not that they are to sweet or to bitter, maybe that a Mocha just seems to heavy. I’ll need to run out and try one to nail down what it is that turns me away. Ahhh, the sacrifices we make in the pursuit of Starbucks research. @Sheila – I remember the mocha valencia! Though I think that was just an orange syrup with mocha sauce – the same mocha sauce as now. It must’ve been about 2004. It was good. I remember ordering Italian sodas with it. @Megan – I owe you! Thank you for your huge help with this article. I’m totally fascinated by the number of mocha tests in the past year or so. While I like the idea of a dark mocha, I don’t like the idea of using a powder. From past (drinking) experience, it usually doesn’t dissolve completely, even if you really try to mix it (think hot chocolate mix in hot milk/water). And while you may get a bit of unmixed sauce occasionally now, that’s not nasty tasting like a lump of unmixed powder is. A small coffee stand where I used to work would make dark chocolate mochas by steaming mini Ghirardelli chips with the milk, which worked (and tasted) great. The mocha I was looking forward to try was one Starbucks tested a few years ago, a Black Forest Mocha. Cherry and chocolate go great together. However, I guess their version wasn’t popular enough or the formula didn’t work, since it didn’t get out of the test market phase. As long as it tastes as good as my long lost Chantico that I sore sorely miss, then I’m in for this if it ever comes around to NJ. Which 2 stores in WA? Wow that’s so awesome that you got to try it!!! Finding how to leave seems to be more than my almost 69 years can handle. Love dark chocolate. I live in the Dallas, TX area & am jealous that you got to try this drink in WA. All the reserve stores are to the distant north of me, but if it were available here, I would probably go. Still I will keep it on my wishlist. Still cannot leave A COMMENT without doing it twice to correct 1st attempt. Sorry. Did you know there is a white Mocha text going on right now too? @Zac – What is the white mocha test happening now? Or think I heard there was some plans for a limited number of stores to simply offer the WM with fewer pumps of sauce for a less sweet option? @Heather M – Juanita store. One barista seemed fairly sure that you could also find this at the Woodinville evenings store, but I can’t say that for certain. Dark chocolate is my go-to sweet treat. Like someone else mentioned I would hope the powder was well-incorporated. It does sound delicious to me. 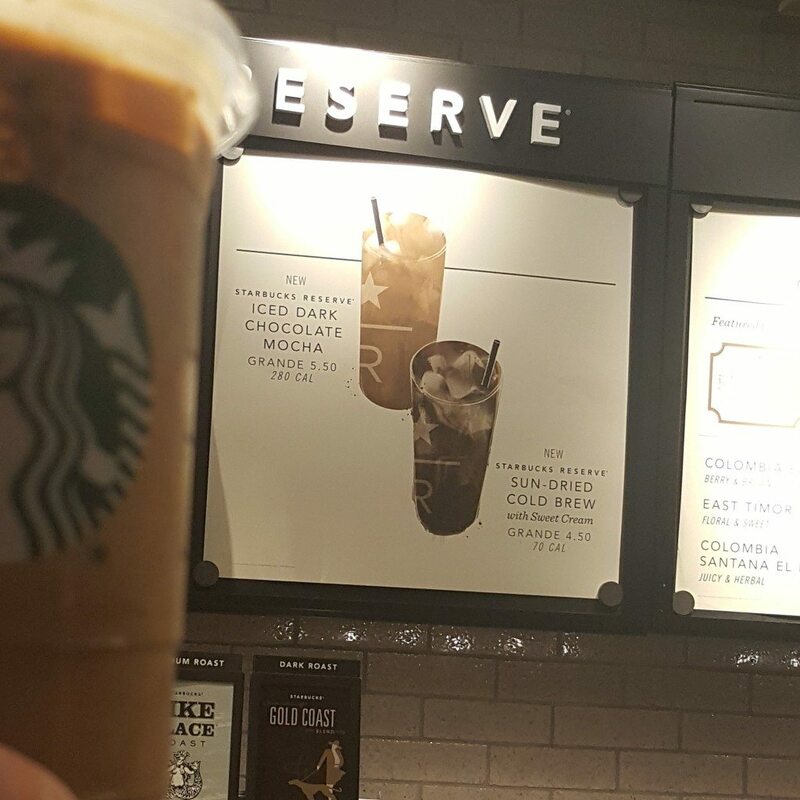 That mocha looks fantastic – usually, I get a light-ice mocha for extra creaminess, and this reserve iced mocha looks the same.